Eating a single serving of red meat per day may raise the risk of early death, a new study found. The study, which followed more than 120,000 American men and women, linked daily consumption of unprocessed red meat with a 13 percent increase in mortality risk. A daily serving of processed meat carried an even bigger risk. Eating one hotdog or two strips of bacon per day was associated with a 20 percent increased risk of death, according to the study. "It's not really surprising because red meat consumption has been linked to an increased risk of chronic diseases, such as cardiovascular disease and cancer," said Dr. Frank Hu, professor of nutrition and epidemiology at the Harvard School of Public Health and co-author of the study published today in the journal Archives of Internal Medicine. "What is surprising is the magnitude of risk associated with very moderate red meat consumption." 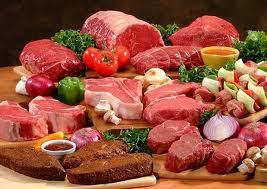 Nearly three-quarters of the study participants reported eating one or more daily servings of red meat. "Habitual, daily consumption of these products is actually very common, both in our study and in the general population," said Hu. People who ate red meat regularly tended to have other bad health habits, like smoking, drinking alcohol and being physically inactive, according to the study. They also tended to eat fewer fruits and vegetables, which are linked to decreased mortality. But even when Hu and colleagues controlled for those risk factors, the red meat-mortality link stood. The study could not conclude that red meat consumption caused the increased risk of death, rather that there was an association between the two. But red meat contains compounds known to boost the risk of cardiovascular disease and cancer, such as saturated fat, sodium nitrites and other "chemicals produced during processing and cooking," Hu said. Swapping red meat for healthy protein sources, such as poultry, fish, legumes and whole grains was linked to a decrease in mortality risk, ranging from 7 percent for fish to 19 percent for nuts. Dr. Dean Ornish, clinical professor of Medicine at the University of California, San Francisco, urges people to scale back on red meat consumption for another reason: the environment. A quarter-pounder with cheese "takes 26 ounces of petroleum and leaves a 13-pound carbon footprint. This is equivalent to burning 7 pounds of coal," he wrote in an editorial accompanying the study. "What is personally sustainable is globally sustainable. What is good for you is good for our planet."